When filtering tables to create the appropriate view of data, report creators (and data modelers) face challenges when determining how filtering is applied to a report; the filter context of a table was held on one side of the relationship, but not the other, often requiring complex DAX formulas to get the desired results. With bidirectional cross-filtering, report creators (and data modelers) now have more control over how filters are applied when working with related tables, enabling those filters to be applied on both sides of a table relationship. This is accomplished by having the filter context propagated to a second related table on the other side of a table relationship. 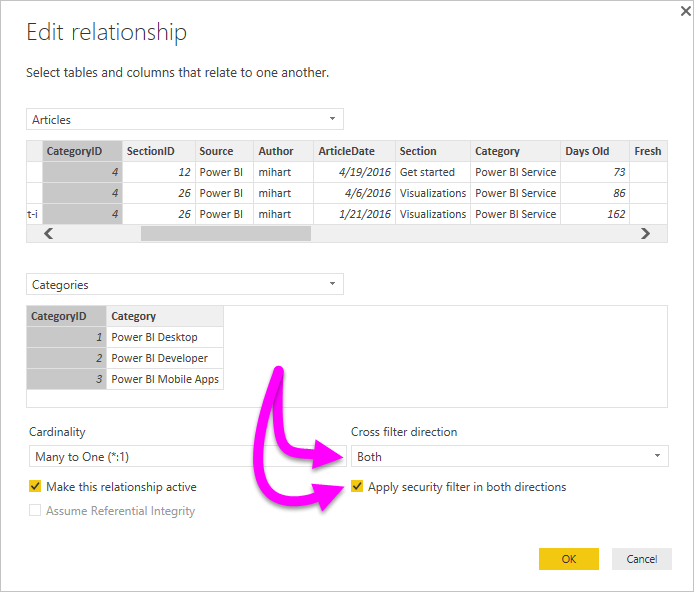 A detailed whitepaper is available that explains bidirectional cross-filtering in Power BI Desktop (the whitepaper also covers SQL Server Analysis Services 2016, both have the same behavior). When creating cross filtering DAX formulas in Power BI Desktop, use UserPrincipalName (which is often the same as a user's login, such as joe@contoso.com) instead of UserName. As such, you may need to create a related table that maps UserName (or EmployeeID, for example) to UserPrincipalName. For more information, and for examples of how bidirectional cross-filtering works, check out the whitepaper mentioned earlier in this article.